Master every shot with the Champion Sports Floor Hockey Collapsible Goal. This fully foldable and collapsible goal is crafted from impact resistant ABS plastic. Custom fittings allow the top and bottom of the goal to fold inward, making the storage size only 5" deep! 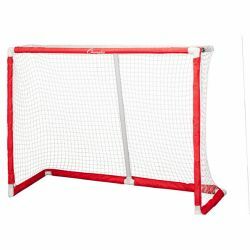 This 54" goal includes an all-weather net with a heavy-duty nylon sleeve—perfect for play indoors or outdoors!